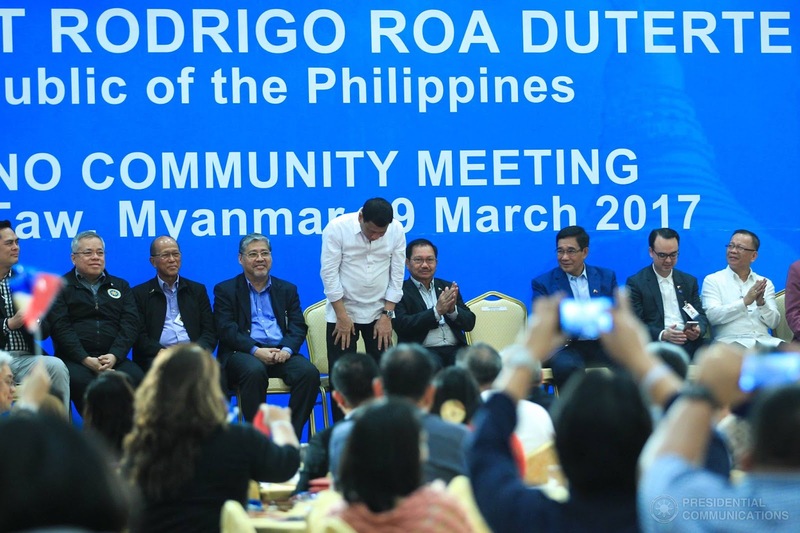 MANILA, March 20 (PNA) -- President Rodrigo Duterte urged Filipinos in Myanmar to visit the Philippines to experience that the country is much safer under his current administration. In his speech before the Filipino community in Myanmar, President Duterte encouraged the community "to go home and find out what's happening in our country." "At least makakalakad na kayo. It will be peaceful. And your children can go out, and your sisters and brothers, and they will be safe," President Duterte said. Duterte arrived on Sunday evening at around 6:10 p.m., Myanmar Standard Time, for the honors at the Naypyi Taw International Airport while a cheering crowd of around 250 Filipinos waited for him to arrive at the Horizon Lake View Resort where he delivered his speech. There was also a short red carpet on the tarmac lined with Burmese honor guards where the President was met by Philippine Ambassador to Burma Alex Chua and Myanmar officials dressed in their traditional garb. The meeting with the Filipino community is the first activity scheduled in President Duterte's first official visit to Myanmar and gave a talk before Filipinos about his administration's priority programs in the Philippines. According to Presidential Spokesman Ernesto Abella, President Duterte will be aiming to further strengthen the friendships of both Myanmar and Thailand through greater cooperation in fields of mutual interests. The President reiterated in his speech before the Filipino community his promise to protect the Filipino people and to preserve his nation. "Actually all I have to do is just to remember my oath and I would do anything to protect the Filipino and preserve my nation. ‘Yun lang ang trabaho ko," he said. 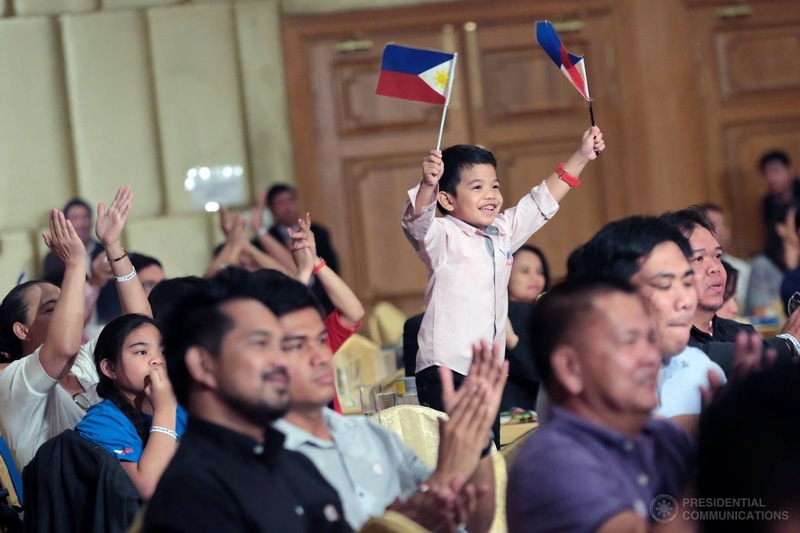 Duterte also emphasized that he wanted to promote the bilateral relations and the cohesiveness of the organization among the Association of the Southeast Asian Nations countries. "It’s high time that we put up something also vis-à-vis ‘yung EU. Ganon na lang," he said. Duterte also thanked the government of Myanmar for helping the Philippines in many ways. "My gratitude to you, to the government and the people of Myanmar," he said. Duterte also mentioned that he really promised to stop graft and corruption in the current administration. "There will never be graft and corruption in my government. Hindi talaga ako papayag," he underscored. "Sabi ko na the first whiff, the first whiff of corruption. Pagka medyo may nagsingaw, let’s go separate ways para walang, wala nang duda-duda ang mga tao and I’m committed to really do that," Duterte added. In a media interview, Duterte said that he seeks charter change to shift the country's form of government to a federal system; political power and government resources under this system will be decentralized to the countryside. He mentioned that he was considering former president and current Pampanga Rep. Gloria Arroyo to a body that will propose changes to the 1987 Constitution. "Maybe, maybe. Maybe pero baka ayaw din niya (She might not agree). But maybe," he said of Arroyo's possible inclusion in the constitutional commission. During his speech before the Filipino community, Duterte said he was "okay" with his US counterpart, Donald Trump. "Si President Trump, okay kami. Okay kami ni President Trump and I can assure him also of our friendship and cooperation. Walang problema 'yan," Duterte said.